During your next camping holiday, come and cool off in the aquatic area of the Yelloh! Village Les Ramières. Its two 100 m² pools, paddling pool, water games and whirlpool bath make it the perfect place for sharing some great times with the family. We've thought of everything and especially of you, and one of our pools is heated. You'll be able to enjoy the delights of the water whatever the season! So after a few lengths of the pool, you'll be able to lie back comfortably on one of the sunloungers and get a bit of a tan beneath the Mediterranean sunshine. 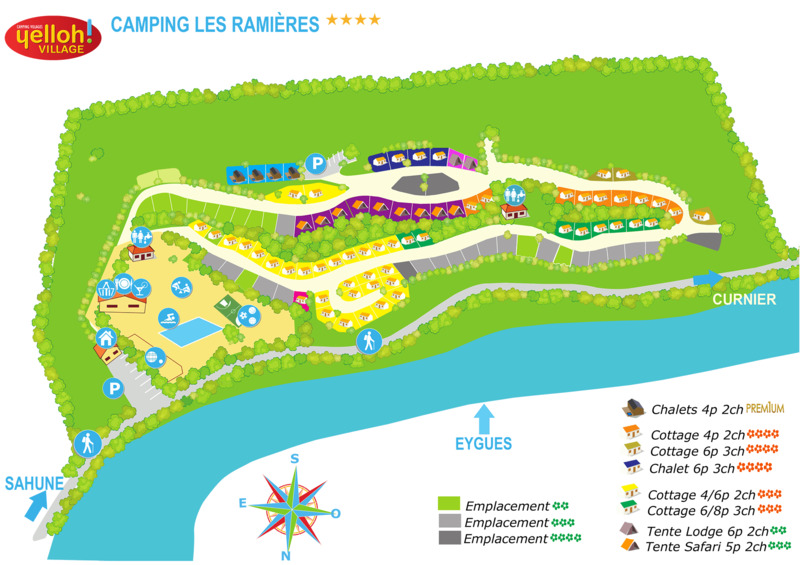 Perfectly positioned, the camping Les Ramières runs alongside the Eygues river. With its crystal-clear water, pebbles, ripisylves (forests along the riverbank), white poplar trees and more, an exceptional natural setting awaits you. Come and recharge those batteries over a picnic or during an afternoon with the family! Maybe your children will be able to catch a few crayfish or be lucky enough to see an otter!